Artemis Health | Do You Have One Hour A Week To Improve Your Benefits? However, even with the barrier of time, 89% of employers said they’re very likely or somewhat likely to use benefits data analytics in the next 12-18 months. They know it’s necessary to a sound benefits strategy, but they just can’t imagine taking on one more implementation, vendor evaluation, or daily task. We get it. It’s not easy to find that extra time in your day for something that you might not have the skills in-house to do. It’s undoubtedly easier to trust vendor or carrier reports. It’s definitely more convenient to have a broker or consultant provide standard reports. But is it enough to really improve your benefits? In just an hour, you can find prescription benefit savings for both your organization and your members. 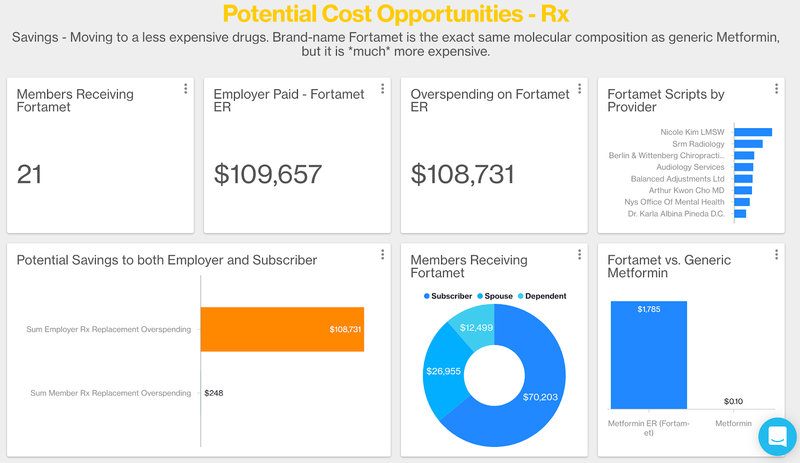 This sample analysis shows how many members are taking an expensive, name-brand diabetes drug and the substantial costs for employers and members. It identifies these members by type, and calculates the potential savings from a formulary change. In less than one hour, you could set up a “Cohort” in Artemis to track a group of members with something in common: a diagnosis, a chronic condition, a prescription, an episode, and more. In the example above, our Cohort of members has taken an opioid prescription between Dec. 2015 and Nov. 2016. We can use this group as the basis for addition analyses, like seeing if these same members are enrolled in a wellness program, looking at absenteeism for the group, or comparing their costs to those of members who are not in the Cohort. Also in less than an hour, you can determine if your members are accessing preventive care. Using the Explore App in the Artemis Platform, we filtered our sample population by Service Category and narrowed it down to “Preventive and wellness visits.” Then we also filtered by age, looking at just members over 50. These folks are often visiting the doctor for routine, recommended screenings once they hit age 50, like mammograms or colonoscopies. We are further able to measure the number of claims, the number of members with claims, the employer paid amount, and more. So when we hear from employers that they don’t have time for benefits data analytics, it inspires us to create better, easier-to-use tools that make it possible for anyone to make progress on their benefits programs. If you have an hour a week, you have the time to make your benefits even better for your members. Want to learn more about Artemis’ solutions for employers or consultants? Watch a demo here.